Ford has added the 2019 to its online Fleet Order Guide. Here's what we found. Ford has updated its 2019 Fleet Order Guide. The new Ranger is included, though many details are not yet filled in. Here are some things we did learn from the guide, at least as applies to the fleet version of the new 2019 Ranger. The new Ranger will come in XL, XLT, and Lariat trims. There will be Supercab and Supercrew body styles with four or five passenger capacity. Packages for the 2019 Ford Ranger appear to be the usual. There is an FX4 off-road package, Chrome, Sport, Appearance, and Tow packages. 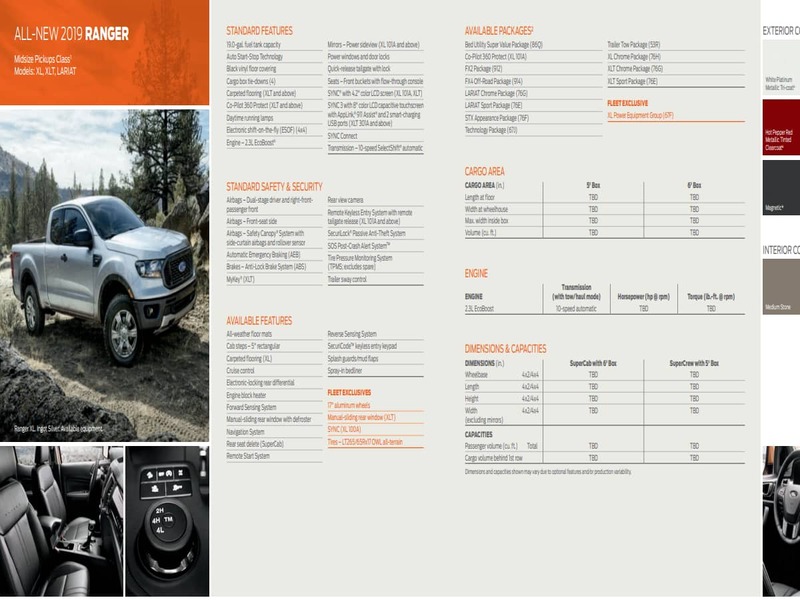 In case there was any doubt, the new 2019 Ford Ranger is coming with just one drivetrain. It will be the 2.3-liter, 4-cylinder turbocharged engine mated to a 10-speed automatic transmission. No room in the brochure was left for a base or up-powered engine option, nor is there any manual transmission. Standard features for the new Ford Ranger will include auto stop/start and emergency auto braking. Most Rangers will have keyless entry with a remote tailgate lock. The brochure highlights some interesting fleet-exclusive features. These include a manual sliding rear window, 17" alloy wheels, Sync and all-terrain tires. Ford has not yet listed the new Ranger's fuel economy. Nor has FuelEconomy.Gov published the info. We will keep checking and alert readers when that information is available. Check back at Torque News for frequent Ford Ranger updates. The 2019 Ford Ranger will be on sale in approximately 7 months. Sounds like a Mazda B2000 revived from the dead!